Two of Devon's worst flood-blighted communities are expected to hear on Wednesday that they are to get defences. Bradiford, near Barnstaple, has suffered a series of floods. 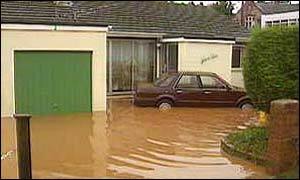 And in 1999 an 85-year-old man died in flooding at Galmpton, near Paignton. Since John Winchester's death on Christmas Eve in 1999, local people have campaigned for defences. Now they are due to hear that they have succeeded, as the Environment Agency meets to approve a �500,000 flood defence scheme. In Bradiford, about 30 homes and businesses there are vulnerable to flooding. The Environment Agency is now planning to spend �1.3m on defences to protect them.